Are you a final year student, looking for final year projects, you are at the right place. We at VTHREESOFT Technologies – Focus on providing quality software education at reasonable price. We are into software training, web development and academic projects development. As students are required to submit final year projects as a part of their curriculum, instead of taking a ready project and submitting it, Here at VTHREESOFT Technologies, we provide an opportunity to learn a technology so that they will be able to develop their own projects. Learn a Technology and get a project for Free*. Project Development Training Batches starting soon. Final year students of BE(CS/IT/IS) ,MCA,BCA ,MSc, BSc, Diploma(IT/IS/CS) and MTech students. Internship jobs in yelahanka, bangalore | VTHREESOFT Technologies. VTHREESOFT Technologies, a software training and development company, is looking for internship trainees to work with us . Pre-Requisites: Should have completed a professional training program on Java or PHP. 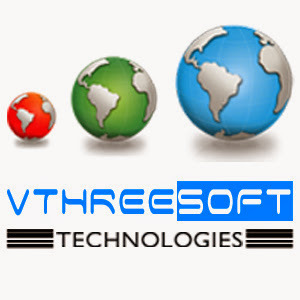 VTHREESOFT TECHNOLOGIES is a software training and development company situated at yelahanka new town , bangalore. At VTHREESOFT Technologies, we are providing training and guidance on IEEE projects for final year students to fulfill their academic purpose. Final year students of BE/Btech, MTech, MCA, BCA, MSc, BSc and Diploma students of CS/IS/IT streams. Why Project Training With VTHREESOFT ? 1. Error free executable code. 4. Project Confirmation and Completion letters will be provided. 6. Project is absolutely free along with a technology training. Cloud computing is a type of computing that relies on sharing computing resources rather than having local servers or personal devices to handle applications. In cloud computing, the word cloud (also phrased as "the cloud") is used as a metaphor for "the nternet," so the phrase cloud computing means "a type of Internet-based computing," where different services -- such as servers, storage and applications -- are delivered to an organization's computers and devices through the Internet. Cloud computing is comparable to grid computing, a type of computing where unused processing cycles of all computers in a network are harnesses to solve problems too intensive for any stand-alone machine. Cloud computing is one of the important part of present day computing which provides so many advantages like, almost 100% service availability over online, virtualization, resource sharing and security and many more. If you are interested to carry out your final year academic projects under cloud computing domain, Contact us immediately on the below mentioned contact numbers or walk-in to our office for more details. Note : Learn a Technology with Us and Get Your Academic Project for Free *. Are you a final year CSE/ISE student, looking for a IEEE project for your academic purpose? 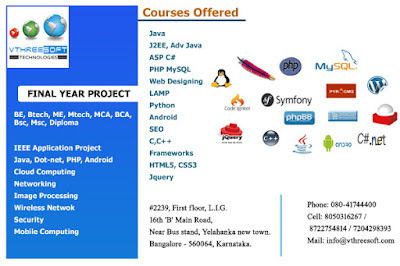 VTHREESOFT Technologies, a Bangalore based software training and development company, located in Yelahanka, is expertise in providing Practical based Corporate software trainings, academic projects development and trainings. We are providing a Training and development guidance for Latest 2015/16 IEEE Projects for CSE/ISE/IT students. Project Technologies we are Handing ? Those who are Interested to learn about your IEEE Academic projects, Can contact us on the below mentioned Contact numbers. Vthreesoft Technologies specializes in providing IT services such as Software Training, Software Development/ Web Development , Academic Projects Training and Development, and Career Counseling. · Java / J2EE / Frameworks(Struts/Springs/Hibernate). · C# with ASP Dot Net. 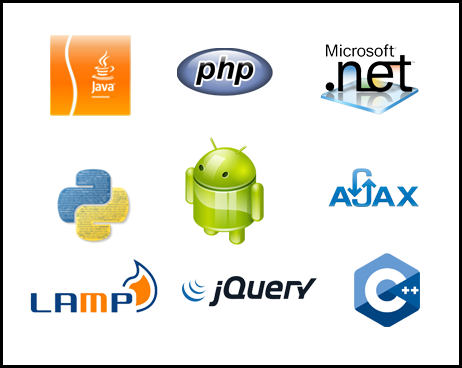 with the above certification process, Learn HTML,CSS,Java Script,Databases(Oracle/MySQL) FREE. Join for a Java Certification at Vthreesoft Technologies and get your academic Projects Absolutely Free. on Top of Jain Medicals.